yep, you did not read it wrong. There are two implementations for News: I’ve proposed this app on our wiki more than an year ago. But I just started implementing it 10 days ago. Coincidentally, Igor Gnatenko and Vadim Rutkovsky have started to work in a different implementation of the same idea. We’ve spent more and more time in big social network sites, which are somehow a smaller version of the world wide web outside, but It doesn’t mean that we want this websites to grow so large until they become the Web themselves. What we love the most about the Web is that it’s open and decentralized, so let’s keep it this way. It’s got ‘space’ for everyone. RSS is the opposite of this centralized world of social networks. It’s got no owner, no privileges, no pricetag. Google — the biggest player on the Web — has been indirectly and maybe accidentally killing RSS. Google Reader was shut down two years ago and because of the death of the first biggest feed reader, websites have been disabling their syndication features. As a consequence, RSS is dying too. We, the free software community, despite of using big social networks as a source of information, we still have individual blogs and aggregators. Since the death of Google Reader we’ve been on an widespread search for an equally great feed reader. 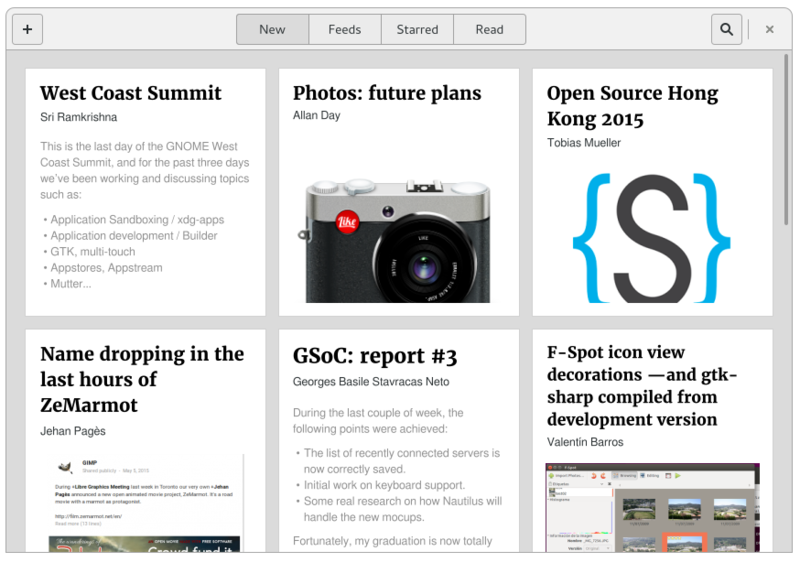 News (gnome-news) is a GNOME 3 native feed reader. It follows a design-based approach for new features just like the core GNOME apps we love. It uses tracker as a datastore, and tracker-miner-rss for feed synchronization. It is written in gjs, using a model-view-presenter/presenter-first design pattern. Using architectural design patterns for GNOME apps isn’t pretty common, but is something I’ve got used to, working for Parafernalia writing apps for the Endless OS. I guess that’s something I will elaborate more on later. It is available on my Github page.